Starting on December 7, world leaders will gather in Copenhagen for the 2009 United Nations Climate Change Conference. 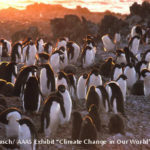 With the Copenhagen summit on the horizon, “Climate Change and Our World“, an exhibit of Gary Braasch’s striking photographs, opened November 18 at the American Association for the Advancement of Science in Washington, D.C. (exhibit pictured above). Braasch, an environmental photographer and author of Earth Under Fire, has documented global warming since 1999 as part of his “World View of Global Warming” project, and his work is powerful visual testimony to global warming’s devastating effects and the need for a solution. The exhibit features large-scale color photographs from Earth Under Fire, revealing the creatures and landscapes that are threatened by global warming, and show the damage that has already been done. A coral reef transforms from a vibrant underwater world into stubble on the ocean floor. 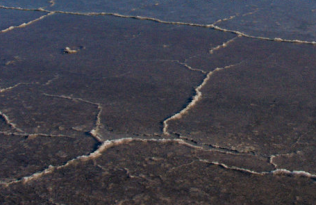 A once-bustling penguin nesting ground near Antarctica (above) dwindles in population. Glaciers recede and vanish (the Antarctic ice cave pictured above melted soon after the photo was taken), and drought strikes some areas, where elsewhere, waterlines rise and flooding encroaches upon cities and towns. Braasch’s work illustrates the causes and consequences of global warming, but also visions of progress, like solar panels and Iceland’s use of geothermal energy to power Reykjavik. We can choose a cooler world, he says in Earth Under Fire, but international cooperation is essential. The AAAS exhibit runs until March 15. 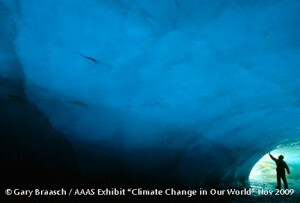 For more photos and exhibit information, visit Gary Braasch’s Earth Under Fire website or the AAAS site. View more of Braasch’s work at Braaschphotography.com.